When the cauldron ignites in Pyeongchang on February 9, it will open a sequence of three Olympic Games in Asia over the next four years -- highlighting the region's growing clout. 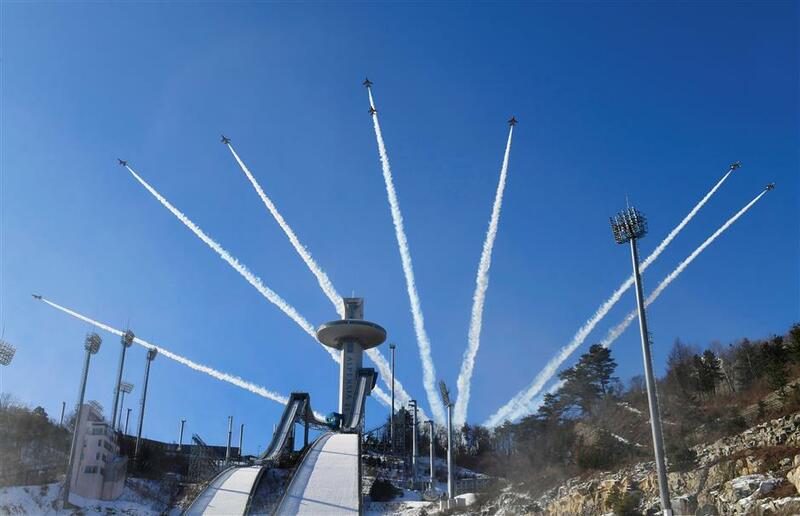 In a photo taken on January 10, 2018 members of the South Korean air force Black Eagle aerobatic team perform above the ski jump venue of the Pyeongchang 2018 winter Olympics, in Pyeongchang. When the cauldron ignites in Pyeongchang on February 9, it will open a sequence of three Olympic Games in Asia over the next four years -- highlighting the region's growing clout, and also the declining interest among Western powers in holding the multi-billion dollar events. After next month's Winter Games in South Korea, Tokyo will take centre stage in 2020 and Beijing will organise the 2022 Winter Olympics -- becoming the first city to hold both a Winter and Summer Games. South Korea (Seoul 1988), Japan (Tokyo 1964, Sapporo 1972, Nagano 1998) and China (Beijing 2008) have all hosted Olympics before, but clearly the appetite remains strong. Outside the region, enthusiasm is patchier -- a fact that was underlined when Rome, Hamburg and Budapest all withdrew from the running to hold the 2024 Summer Games. Last September, 2024 hopeful Los Angeles lost out to Paris but was instead awarded 2028, four years ahead of the normal schedule -- a move perceived as the International Olympic Committee locking in a high-profile bidder while it still could. Beijing-based Mark Dreyer, an expert on China's sports industry, said Asia's Olympic hat-trick signals "a global shift of power". "If we had three consecutive Olympics in the West, people would not say it was so remarkable," Dreyer, founder of the China Sports Insider website, said. "But the fact that it is in Asia -- these are the countries that are able to bid for these events because they cost a hell of a lot of money and often lose a hell of a lot of money. "The Asian countries are able to do this in a way that a lot of the Western countries are no longer able to. "The vibrancy of these economies, particularly China and Japan, versus the West, where people have been struggling, that's why we are seeing a shift towards the East." The 2008 Olympics were a coming-out party for China after Beijing saw off rival bids from Toronto, Paris, Istanbul and Osaka in Japan. But when it came to staging the 2022 Winter Olympics, only Kazakhstan's Almaty and Beijing were left to battle it out after a handful of others pulled out of the running. "Everyone is aware that having three consecutive Olympics in the same area is not great for something that should be the world's premier sporting event," Dreyer said. "I think they (IOC) just didn't have a choice." Victor Cha, director of Asian Studies at Georgetown University, believes that there is "an interesting divergence" in how the Olympics are viewed. "The Olympics are a benchmark of development in Asia," said Cha, also senior adviser at the Center for Strategic & International Studies in Washington, DC. "But in the West, they are becoming a post-modern phenomenon, almost like 'revival games' providing an opportunity to reinvigorate great cities," he told forbes.com. Marcus Luer, founder and chief executive of Kuala Lumpur-headquartered sports marketing agency Total Sports Asia, said that having back-to-back Winter Olympics, in Pyeongchang and then Beijing, was "less about Asia and more about China". "The minute China puts up their hand, people listen," he said, agreeing with Dreyer that there was little choice left for the IOC but to plump for Beijing in 2022 against Almaty, judged as a riskier alternative. "A Winter Olympics in China makes sense on multiple levels: winter sports is still fairly new and not yet a big deal there so exposing that country of 1.4 billion people to winter sports is a smart move. "Globally, for that industry, everyone you can think of in winter sports will benefit from it." Dreyer said that since 2001, when China won the right to stage the 2008 Olympics, "they have been going on a sports drive, going after lots of big events, but also smaller sports that can't pick and choose -- they've all been coming to China. "As much as anything else, for China, it's prestigious." Only one major sports tournament remains out of reach, the football World Cup, but many experts believe that is only a matter of time. President Xi Jinping has openly stated that he wants China to host it, with 2030 appearing most likely. "It's the end-game of all of this, for sure," said Dreyer. "The World Cup is still a pretty attractive prize, whereas the Olympics have been struggling a lot more to secure hosts."